Historically, science experiments and activities have been difficult for us, which is ironic given my background and science degree. Either we find planned experiments to be simplistic, off topic, or requiring too many components for home study. 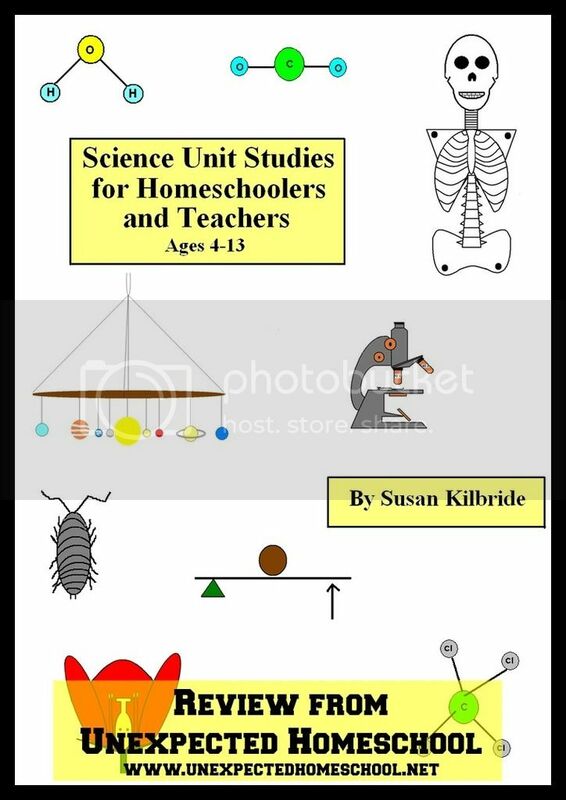 Yet, we were cautiously optimistic when reviewing Science Unit Studies For Homeschoolers and Teachers from Funtastic Unit Studies. For the review, we received the physical book which is geared for ages 4 to 13. The book is written by a homeschooling parent and is designed for use in a homeschool, however it is not limited to only homeschool use. This is not a textbook curriculum at all, but guided science unit studies for the parent / teacher to use with their students. The author suggests using the units in the order presented as some topics do use knowledge learned in other units, but we did not find this to be an absolute necessity especially if your child has basic knowledge of the unit being used. While ages 4 to 13 might seem like a broad range to cover in one product, the lessons are divided into two groups: chapters 1-10 are geared towards ages 4 through 7, and chapters 11 - 20 for ages 8 through 13. The majority of the topics for the younger age group center around biology / ecology- human body, animals, insects, plants, and animals. There are also a couple of chapters on early astronomy and physics. The older age range still has biology options with animals, insects, plants, and microscopic creatures. However, it includes several chapters on appropriately advanced physics, chemistry and even weather. Reading through the unit and drawing representations of several atoms. All of the units start with a clear list of materials needed for every activity in the chapter, right down to items as simple as pencils. There are no surprises when you get into an activity for "common household" items that might not be so common to your home. Chapters 11-20 (for the older age group) end with a quick ten question multiple choice test. The chapters are divided into topical parts which build upon each other in a logical progression, beginning with any base information needed, e.g. definitions, microscope parts, and periodic table pages, and continuing through the instructional sections of the unit. These science unit studies are written to the instructor / adult and include tips on how to present the material, analogies to help in understanding, and questions that lead the students to the expected conclusions. The units all contain numerous fun activities which not only demonstrate the information being taught, but make learning easier for hands-on types of learners. There is a wide variety of activities and experiments in each chapter to appeal to every type of student. Three different diffusion activities. All were a success! We had been studying chemistry this summer, at Amber's request, however our lessons lacked any experiments making it somewhat lackluster. After receiving Science Unit Studies For Homeschoolers and Teachers, Amber and I took note of the chemistry related units for her age group and eventually decided to start with the Atoms and Molecules unit to ensure her understanding of the basics were complete. Immediately I checked the supplies list and noted the one item we did not have on hand, but we did have a possible suggested substitute. However, I did end up purchasing the missing item anyway. Amber is a reader; she devours everything we give her, but doesn't like to be lectured unless she needs further explanation. Although the book is designed to be used by the instructor, I allowed Amber to read through the chapter on Atoms and Molecules before going over the topics with her. This is her preferred method of learning and gave her a glimpse into the intention of the activities. Amber did have a decent chemistry foundation from her other lessons, but was not understanding the practical applications of those ideas. Our selected unit had a total of 16 possible hands-on activities and games. A few of the suggested items we had already completed in recent times, and the games all required more people than we had available (just the two of us). I ended up with 9 fun experiments and activities for us to complete on the Atoms and Molecules topic. All of our experiments worked flawlessly without any hiccups or failures. While we do learn from experiment failures, it can be frustrating when we are unable to demonstrate the point of the lesson. Amber often loses interest when the activity or experiment does not go as expected or when we have no noticeable results. I was pleased at the ease of these experiments especially since we did not need to purchase laboratory grade equipment. These fun science unit studies are easy to use, while having a big impact. We highly recommend them for any science educator. Our entire experience can be summed up with a quote from Amber, "The hands-on projects were more useful than any of my reading. I didn't get it from the words or sketches that molecules are 3D. The marshmallow molecules helped me see how atom placement matters." Visit other members of the Review Crew to see the science fun they had with these Funtastic Unit Studies!